GKMCET has commenced the Department of Management Studies in September 2007 in the interest of emerging as one of the B-Schools of repute. 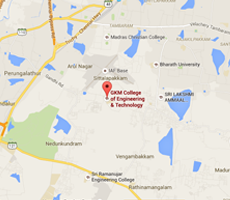 GKMCET offers a two year Post Graduate Program in Management (M.B.A) approved by AICTE. To develop self -motivated young mind with mastery and team spirit, who could set the world best with a sense of honor. The Department of Management Studies has a total strength of six core faculties with Staff-Student ratio of 1:15. The teaching sessions are supported by Group Discussions, Case Studies, Paper Presentations, Video Discussions, Seminars, Role Plays and Business Quiz. The students are exposed to career development programs that include analytical skills, presentation skills, interview skills and soft skills essential to change their personality besides updating their knowledge on current affairs. Apart from the syllabus prescribed by the Anna University, number of value added activities like paper presentation, seminars, symposiums, workshops and training programs are also included in the course curriculum. Guest Lecture is an opportunity for the students to interact with the professionals from diverse verticals and to have an insight into the corporate world. Students are assessed by their performance in the two unit tests, one model exam, class participation attendance, Seminar presentation and other aspects like discipline. The department of management studies has endorsed itself with professional bodies like MMA (Madras Management Association) ,CII (Confederation of Indian Industry) for enhancing the knowledge of the staffs and students. I.V. enables students to have a practical understanding of the business process, enhances the students understanding of the current technology and helps in projecting the students with industries which is an application orientation of the curriculum designed by the University. Also, this is in view of upgrading industrial connectivity there by enabling future placements for the students. The students of 1st year MBA department have visited two companies Greaves Cotton & SAME Deutz Fahr in Ranipet in the Month March 29th. The inaugural function of the association of the management studies - "Forum for Creative Management" (FCM) on December 15, 2007, was a red letter day for the department of Management studies as the supporting pillars of the department have gathered for a memorable occasion of the inaugural event of the "Forum for Creative Management" has been launched with an objective of endowing the MBA students with various skill sets that are in high demand in the market. FCM focuses on harnessing their in-born talents and opportunely explore and expose the students' knowledge and ability.